Historic Muni Streetcar Line Returns to SF, Will Link Directly With Caltrain – Peninsula Moves! When passengers depart the San Francisco Caltrain Station, they’ll now have one more transfer option for travelling around the city—as well as an opportunity to step inside a bygone era of public transportation. On August 1, Muni launched its long-awaited E-Embarcadero line, an historic streetcar route that will run from Fisherman’s Wharf to the Caltrain station at 4th and King Street. For now, the new line will only run on the weekends as a limited-service pilot program. The streetcar will be in service from 10 a.m. – 7 p.m. on Saturdays and Sundays, and will make stops along the Embarcadero as its travels between Fisherman’s Wharf and the SoMa District. Caltrain passengers travelling from the Peninsula will only have to take a few steps to transfer to the line, which will then carry them to points north. Starting next year, the line will run every day, according to the San Francisco Municipal Transportation Agency, which operates Muni. Eventually, the plan is for the service to extend all the way to Fort Mason, something that was envisioned when talks of reviving the old streetcar line first emerged in the mid-1980s. For years, the E-Union historic streetcar operated along a similar route in San Francisco, but it was discontinued in 1947. 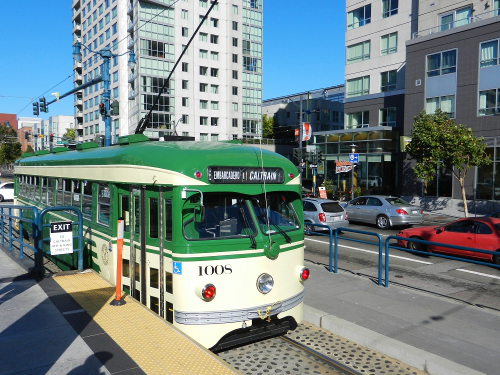 The new E-Embarcadero will compliment Muni’s popular F-Market & Wharves historic streetcar line, which travels between the Castro and Fisherman’s Wharf and carries more than 23,000 daily passengers. That service was reestablished in 2000 and is a favorite of both tourists and everyday commuters. Muni’s fleet of streetcars is comprised of streetcars from across the globe, with some of the vehicles coming from England, Portugal and Italy. Those compliment the stock of streetcars that once roamed San Francisco. Some of the streetcars date back to 1920—meaning passengers will not only be travelling through San Francisco, they’ll also be going back through time.